Fantômas (pronounced [fɑ̃toˈmas]) is a French silent crime film serial directed by Louis Feuillade, based on the novel of the same name. The five episodes, initially released throughout 1913-14, were restored under the direction of Jacques Champreaux and released in this new form in 2006. The series consists of five episodes, each an hour to an hour and a half in length, which end in cliffhangers. Episodes one and three end with Fantômas making a last-minute escape, and the end of the second entry has Fantômas blowing up Lady Beltham's manor house with Juve and Fandor, the two heroes, still inside. The subsequent episodes begin with a recap of the story that has gone before. Each film is further divided into three or more chapters that do not end in cliffhangers. Fantômas was enormously popular upon its release in France, and made Navarre, who played Fantômas, an overnight celebrity. In a rave review from a 1914 issue of the French journal Chronique cinématographique, critic Maurice Raynal wrote that "There is nothing in this involved, compact, and concentrated film but explosive genius." In his contemporary critical review of the Fantômas serial, Peter Schofer notes that contrary to some modern understandings of the series, Fantômas was not interpreted by its audience as a suspense film. Based on a previously published and widely read newspaper serial, audiences of the time were already extensively familiar with the plot, characters, and outcome of the story, making the film much more about how the story might develop as opposed to what might happen next. ^ "Progressive Silent Film List: Fantômas". Silent Era. Retrieved 23 February 2008. ^ Schofer, Peter (Summer 1973). "See Fantômas". Velvet Light Trap. 9: 1–4. 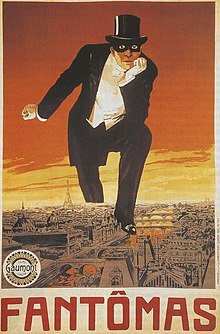 Wikimedia Commons has media related to Fantômas (1913 serial).